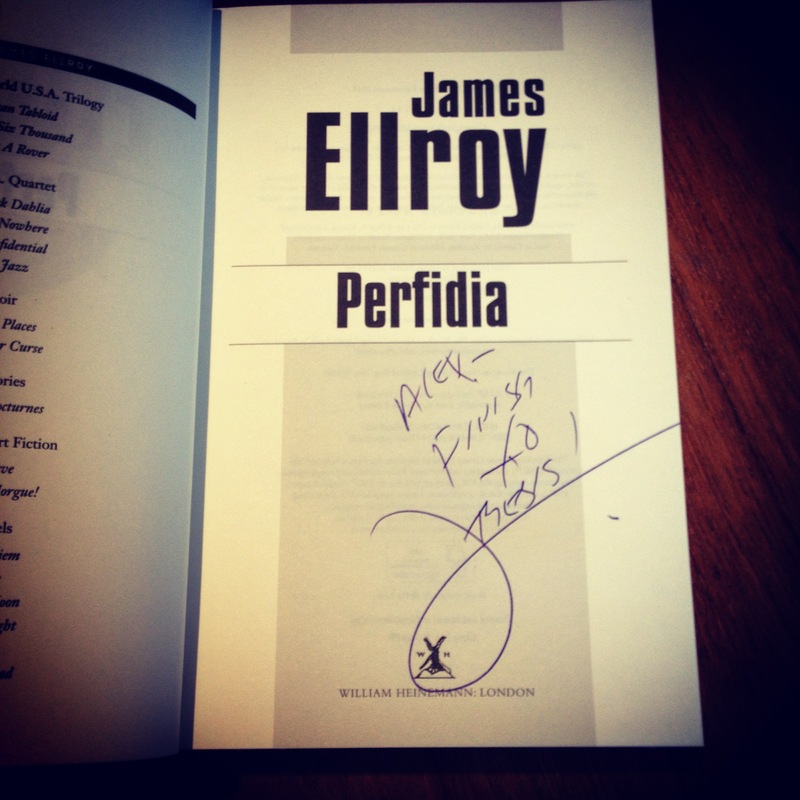 When I saw James Ellroy read from his most recent novel Perfidia at the London Review Bookshop late last year (during which he signed my hardback copy with the helpful admonition ‘Alex – Finish ‘yo thesis!‘), he ended the Q&A session by reciting a Dylan Thomas poem. The recital was in response to a question posed by Ellroy himself – in other words, he wanted an excuse to recite it, and nobody had asked the question to which he had prepared it as an answer, that question being, ‘Why do you write?’. The link contains a great recording of Thomas reading the poem in his sonorous tones, and it motivated me to go back to the recording of the LRB event to check if it included Ellroy’s recitation – which, happily, it does (starting at 1:02:00). Not for the proud man apart / From the raging moon I write / On these spindrift pages / […] But for the lovers, their arms / Round the griefs of the ages, / Who pay no praise or wages / Nor heed my craft or art. With its invocation of ‘the lovers, their arms / Round the griefs of the ages’, the poem chimes with Ellroy’s insistence, earlier in the Q&A, that Perfidia and the other novels planned to follow it in the Second LA Quartet, should be considered romances. But it also evokes, for me, a couple of vivid (and similar) scenes from novels in the First LA Quartet. Love me fierce in danger. I saw Ellroy recite Dylan Thomas in Manchester last September. He was mesmerising. Great post.